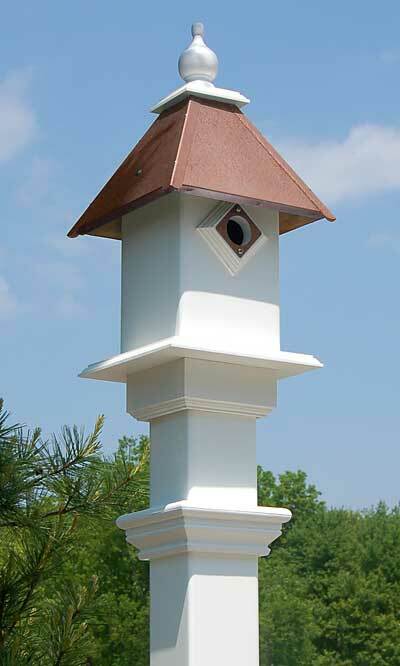 Create a focal point and elegant shelter in your bird garden with this Classic Bluebird House and Mounting Post. The clean lines, white color, and durable construction of these two pieces make this package a fantastic addition to your bird garden. The sturdy, Wing and A Prayer Classic Bluebird House, crafted from square PVC tubing, offers plenty of room for a bluebird family to roost. Its significant, copper colored, metal roof protects the interior from the elements, and a white finial atop the piece adds a finished look. Bluebirds can easily enter the shelter through its 1.5" diameter, front opening, and extra PVC and metal around this hole prevent other birds from enlarging it. Slide the integrated mounting collar on the home over the included New England Decorative Mounting Post, for a wonderful display. The 60" height of the post situates this abode at a fantastic spot for bluebirds, and its white, vinyl construction meshes with the PVC of the shelter. An included, galvanized steel anchor ensures the post remains stable in your garden, and its flared base and top trim add elegance. The white hue on both the house and post remain crisp and lovely for many seasons, while the copper colored finish on the roof captures attention. Add beauty as well as a functional shelter for bluebirds to your garden with this Classic Bluebird House and Decorative Mounting Post package. Bird house made in the USA.